This leaf depicts a story from the life of Saint Jerome (about 341 - 420), one of the four doctors of the Church. One day, a lion entered the monastery where Jerome resided, causing his fellow monks to flee, but Jerome recognized that the beast was injured and he cured it by removing a thorn from its paw. The saint's monumental form fills the foreground of the composition, setting off the delicate gold tweezers Jerome uses to extract the thorn. In the background, a monk approaches with a pot of ointment and a bandage. 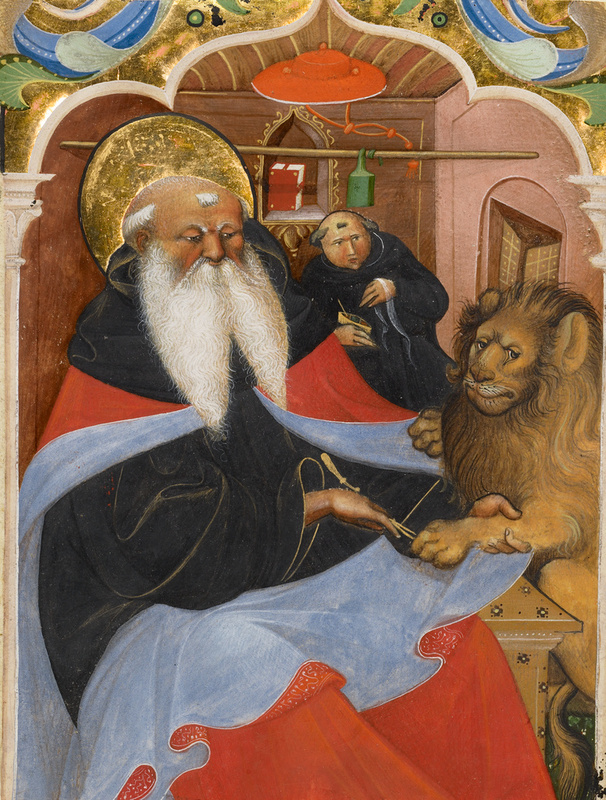 The encounter between man and animal, in which Jerome comes to the lion's aid, is poignant, showing the moment when the lion submits to the saint, the saint's concentration as he removes the thorn, and the apprehensiveness of the attendant monk. This cutting likely represents a large miniature or initial from a gradual probably commissioned for the Camaldolese monastery of San Mattia in Murano. This manuscript was one of the most lavish and elaborately illuminated Lombard choir book commissions of the fifteenth century. The artist responsible for its decoration it is known as the Master of the Murano Gradual. This illuminator likely worked between the regions of Lombardy and the Veneto and he is notable for his originality and his imposing figures clothed in voluminous drapery, their faces strongly modeled and expressive.